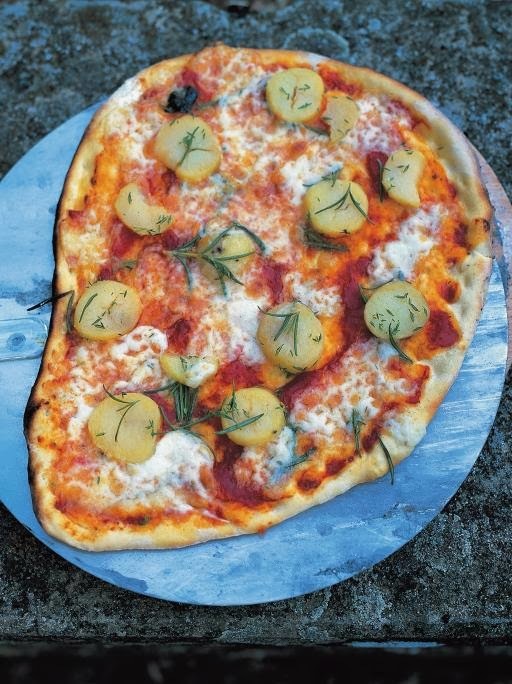 Recipe for pizza dough and tomato sauce can be found here. Smear the tomato sauce evenly over the pizza base. Slice the potatoes into 0.5cm/¼ inch thick slices and toss in a bowl with the rosemary, thyme, a good lug of olive oil, a small squeeze of lemon juice and a pinch of salt and pepper. Scatter them over the pizza base and put small torn-up pieces of mozzarella into the gaps. Cook until crisp and golden.